since we didn't get a guided cave tour we decided to at least have some fun with ski-doos (or snowmobiles as they're sometimes called) today. so we booked two ski-doos at "camp alta"[01-19] in kiruna. it turned out that there's a frozen lake we were riding our snowmobiles over and then had a track through the woods. we slowly increased the speed each time we had a long straight trail. we soon ended at 90km/h. pretty fast, pretty shaky, and... pretty cold. sonja and me had a little bit of our noses uncovered. we ended up with frostbites and dark red areas on our noses. actually i only uncovered my nose once for about five minutes. seems this was enough. sonja's burns were a little worse. poor her. ulli had no problems at all, her face was covered all the time it seems. after having a lot of fun with the snowmobiles we got back on the car again to get closer to lulea. we decided to return our car there and take the night-train to stockholm. this would on the one hand save a lot of gasoline (thus money) and time. since it would have been a long way to lulea we decided to spend the night in gallivare. on the way there we saw two moose[37-42], and had again a nice sunset[47-68]. a few hours later we finally arrived in gallivare[70-77]. we decided to go back to abisko once again. first of all because they had a free room for us, secondly because we still hadn't seen any northern lights so far, and thirdly we still wanted to take the ski-doo tour. abisko seemed the perfect place for that. also there were caves and frozen waterfalls around the place. we wanted to go there. so the first thing of this day was to drive back again for three hours. unfortunately no guided tour was offered for the caves, so we decided to see the frozen waterfalls[01-30]. afterwards we drove back to the hostel, had again the very unique sauna-experience they offer there at abisko, when suddenly... we saw them! at 21:44 some chinese guy rushed into our room and said that there are northern lights outside. at first we didn't believe it, because a few days ago a chinese said he spotted them, but it turned out to be only a cloud in the sky. actually there were a lot of chinese people there. 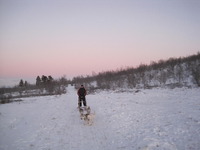 one said that's because there seems to be a very popular blog on a trip through north-sweden. it also mentions this hostel we stayed at we were told. additionally asian people believe that seeing northern lights gives a long life and loads of luck for the future. that's why we saw asian people quite often in sweden. but this time there really were northern lights. unfortunately not very bright and strong, but hey, at least there were some. yippieh, we finally saw northern lights! again all my equipment froze including the tripod. i only took it with me to take northern lights pictures with it, and then some joints and turning handles just froze - weird. since, once more, also the battery pack stopped working, i couldn't take more pictures of this beautiful phenomenon. this day we went around with thommy and nadine[050-051]. they brought us to some nice spots near fjelldal (yop, an IKEA bed is called like this too). first one was a nice place where there were reindeer[005-019], then a beautiful beach[030-053] with frozen sand and the sea. next stop was thommy's relatives, having a farm-house right next to the sea. there we had coffee (or tea as some of us preferred), delicious cakes, a nice talk, a cat[055-060,128], a baby[125-126], and a nice walk around the house down to the beach[061-091]. later we got a guided tour through the cow barn[095-122]. when we got out of the barn it already was dark again. so we drove back again to stay another night at thommy's place. once more we had awesome food like salmon and prawns with a very tasty sauce and white bread. nomnom. the nights up in the north were so very bright and full of stars. this is so incredible and quite often breathtaking. i've never seen that many stars in the sky. my camera really suffers a lot. the temperatures once more made it freeze, so focusing makes a really painful sound. also the battery did not last long again. warming up the cells helped though. and once more condensate fills the body and the lenses. poor canon. me on the other side by now enjoy the temperatures outside. yippieh. day 07 turned out to become a day of relaxing, talking and doing research and planning stuff since we had no car key yet. thommy brought us to the airport near narvik where a bus was leaving for the town center. ulli and me drove to get the key from thommy's friend in narvik. sonja was doing the laundry in the meantime. the bus ride took us more than one hour, but after that the guy with our key was already waiting at the parking lot and handed it over. we finally got access to our car again - yippieh! driving back by car took us again more than one hour. losing car keys is pretty time consuming we found out. since we lost so much time, all plans had to be changed. currently we think about not going back to stockholm by car, but rather stay in the north of sweden (and maybe norway too) and drive back by a night train at the end of our trip. this saves a lot of time and is less exhausting than driving by car on icy roads and in total darkness (since we want to use the few hours of daylight for our activities). still no northern lights, but norway is so much warmer, due to the sea. temperatures range from -15 to -5 degrees. pretty warm compared to the -32 degrees we had in north sweden. today we didn't do quite much since sonja lost the keys to our car somewhere in narvik, norway. so all we did on day 06 was taking pictures of the hostel's cat, going to narvik by car, planning our next steps on the tour to finally, after hours of planning, finding out that the key is gone. the next few hours we spent searching in narvik for our key, walking again all the streets and places we've been to since we left the car. but no way, no key. luckily thommy, the guy we first met on new year's eve providing the people at the hostel with totally delicious salmon and crabs, gave us a call, since we said we are going to meet him today in norway. after getting up at around 09:30 and not much sleep due to the new year's eve celebrations the night before we were heading to the meeting point for the dog sledge tour we booked for this day. again we met thomas, the guy we had much fun with since we arrived here at the hostel. he was giving instructions on how to put on the dog's harnesses and how to tie the dogs to the sledge. all people were divided into two groups. the first group started with the dogs while the other group was brought to some other meeting point with some ski-doo where the groups were switching then. i was in the group to start with the sledge. so there are four dogs keeping on running all the time, only stopped by a break you can step on with one foot while the other one resides on the sledge so you don't fall off. branches of trees and huge bumps on the trail made it quite hard in the beginning to stay on the sledge, but after a while one got used to it and felt quite comfortable riding the sledge. since there were more sledges for each group than people i could stay on the sledge when the groups shifted. i really enjoyed it and it was great fun. the girls also had a lot of fun, but more with the ski-doo ride over bumpy trails rather than with going with the sledge. the pretty interesting thing was the fact that the dogs ate feces from other dogs. the guys told us it's because there's still a lot of useful thing in the turds the dogs can digest. but only the first poop after having eaten. the second round they leave untouched. i didn't bring my camera to the tour since i thought it's too dangerous for the equipment. i thought it would break if i fall off the sledge. but actually i never did. sonja took some pictures with her camera. i will try to put them online as soon as possible.